Twitter research reveals that 40% of users say they’ve made a direct purchase as a result of a tweet from an influencer. On YouTube, 60% of subscribers say that channel’s influencers sway their purchase decisions. Other research found that 57% of all internet users over age 16 have made a purchase based on an influencer recommendation and 69% of millennials report buying products that influencers recommend. 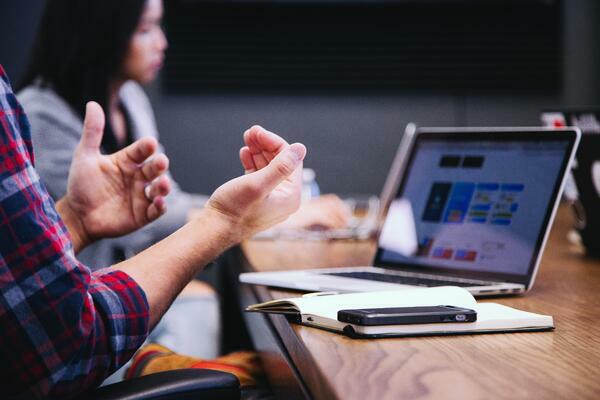 Influencers of all kinds play a growing role in affecting a prospect’s decision, and it’s important to better understand the influence difference and its potential impact in your content marketing program. It’s not enough to hire influencers and keep a list of the posts they share. Influencer content must be tracked with the same gusto as you apply to the content you produce directly. Providing influencers with tracked links lets you build a funnel of users referred from this channel and enables you to compare influencer-related site visit behavior to those attracted through other methods. You also can use automated data such as “likes,” comments, shares, link clicks, etc., with a manual review of the influencer’s content to rate the quality from your brand’s perspective. This lets you understand what’s working in a granular way. If you only use direct attribution for influencer content (i.e., user reads influencer content, clicks on link, and makes a purchase), you’re likely painting an incomplete picture, particularly as social networks actively strip tracking from links posted organically. In a recent client campaign, 67% of the sales were completed within 24 hours of exposure to the influencer content; only 3% bought directly from the influencer’s link. Tracking via influencer marketing is notoriously difficult because there is no such thing as a linear consumer journey in 2018. That does not, however, mean you shouldn’t try. Your metrics can range from simple vanity metrics that are good for measuring the relative scale of one effort compared to another to the precise measurements of increased foot traffic in stores. 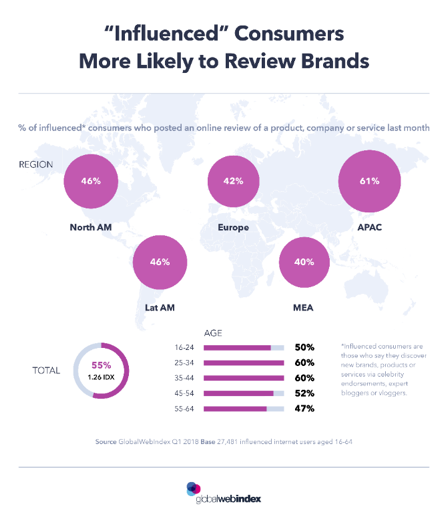 GlobalWebIndex, which analyzed over 27,000 internet users in the first quarter of 2018, found something interesting: “Influenced” consumers were more likely to leave a product review than other shoppers. GWI defines influenced consumers as “those who say they discover new brands, products or services via celebrity endorsements, expert bloggers, or vloggers” and found that 55% of them posted an online review of a product, company, or service in the last month. That number was 26% higher than the average consumer. People who buy from influencer content are different than the average customer. Think about how Amazon (a client of ours) has used heavily emphasized social proof in the buying experience over the last decade. Influencers contribute to social proof by indicating your product as worthy of purchase, but the GWI research shows that influenced consumers could help you even further. Be sure to give them a reason and an opportunity to leave you a positive review. Brands sold at retail also may have an end-cap promotion, advertise the products in the circular, have a two-for-one deal, etc. In those cases, measuring the impact of the influencer program may not be possible. But other times, with some creative planning, you can build a program with a strong benchmark period to allow for more meaningful results. Either way, spending time answering, “How will we know if this is successful in terms of sales?” can lead to useful outcomes. Influencer marketing is only growing as brands see positive results. Instagram influencer marketing alone is expected to reach $2 billion by 2019. As those numbers increase across platforms so will the expectations put upon content marketing teams by upper management. Are you ready?